I am disabled and cant ride two wheels anymore. I bought the original blue trike for just at $400. I didn't like how unstable it was because I am so tall. So I decided to turn it into a more recumbent type ride. The front forks are from a child's motorized trike Chopper and if you notice I added a three sprocket front peddle so I turned it into an 18 speed instead of just six. As soon as we move into our new house I am going to put a 49cc kit four stroke motor on it. 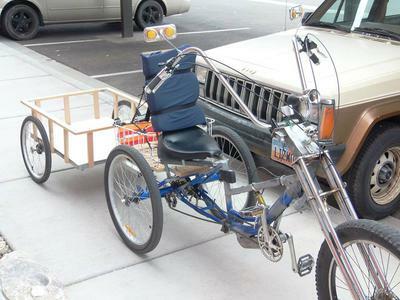 The trailer was built from a two child bike cart I stripped down and created it. Soon as we move into the house I will start making three wheel trikes for sale. Comments for My Custom Made Trikebike!